Anyone else have a kid that is all into Power Rangers? I have to admit this is a new fad in our house with our 5 year old after discovering the show on Netflix. He was thrilled to have two whole seasons to watch in his room for his bedtime television time with the release of Power Rangers Megaforce: The Complete Season and Power Rangers Super Megaforce: The Complete Season. These collections have a lot of viewing time with over 7 hours on 5 discs each! 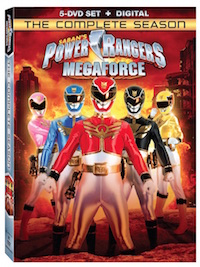 When the evil Warstar aliens plot a massive invasion of our planet, Earth’s supernatural guardian, Gosei, mobilizes a team of five extraordinary teens with the talent and attitude to oppose them: the Power Rangers Megaforce! In order to stop ruthless Prince Vekar and his massive alien Armada, the Rangers have only one hope: to unlock the special keys — and harness the amazing powers of Legendary Rangers of the past! 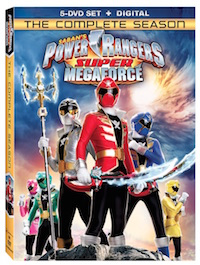 You can get your copies of Power Rangers Megaforce: The Complete Season and Power Rangers Super Megaforce: The Complete Season on DVD at your local retailer or online at stores like Amazon!